I want to tell you about a very special bridge I have been fortunate to stand on. 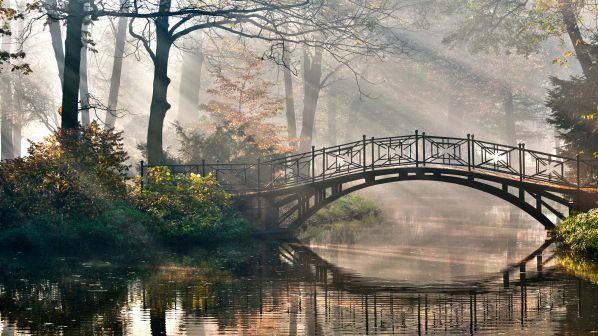 It is a bridge between two different cultures a person had a chance to get to know to such extent that he/she actually understands it, accepts it fully and respects it. You look left and right and you can connect to both the cultures in a special way and it becomes crystal clear that making any comparisons is beyond unfair. First time it happened to me was when I went to USA as an exchange student to spend my senior year of high school submerged in the culture I knew nothing of. I started off as any greenhorn on this field. USA was a “wow”! From neatest lawns I have ever seen, to widest roads, to stores opened 24/7, to drive through ATMs, friendly people - you name it! I was absolutely overwhelmed with everything and beyond impressed. Few months passed and surprisingly the admiration and awe turned into something more negative. I all of a sudden thought Americans are shallow and superficial and everything that amazed me before turned into over done facades I no longer appreciated. I was frantically comparing everything to my country and due to sever home sick phase nothing could compare to my precious homeland. I call this a stage two of the submerging into a new culture. Stage one being the “wow” stage! As I learned later in life this “wow” stage can also be in a different context all together. Like a “holy cow!” type of a wow stage. Few more months passed in my USA experience, nearing a year in fact, when for the first time this magnificent bridge appeared out of nowhere. I was standing on it with a whole different look on the newly discovered culture. I no longer had anything bad to say about any American or their culture. Even the jokes about the dumb Americans, and their lack of geographical knowledge weren’t so funny anymore. This rather special bridge made me see and feel the culture. I saw clearly why comparing is impossible, why passing judgment about any aspect of a different culture, custom or religion is a useless, unproductive task. In fact, it can be rather harmful because it does not promote openness to cultural diversity. Later on in life I met face to face with India! The stages might have been a bit different - the “wow” phase was not so impressive - but eventually the bridge appeared. It took a lot of ups and downs to reach it. A lot of positive and intensely negative experiences as well. 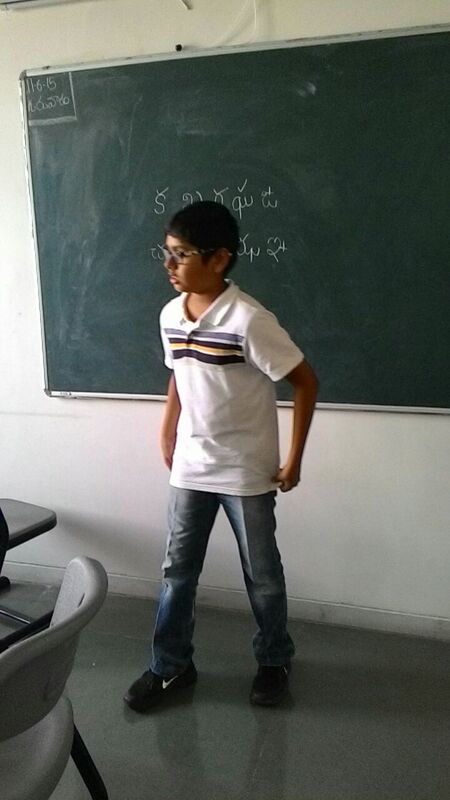 India challenged me like no other country before. Yes, getting to know a new culture changes you forever. It makes you stronger, richer, widens your horizons and like my grandfather put it before I left for my first longer stay in a foreigner country: “Remember, each culture you get to know for more than a year – equals to a university degree from the most reputable institution.” I couldn’t agree more. Maybe the graduation ceremony is when you find yourself standing on the bridge! In last week's 'Paragraph a Week' students have been assigned a new topic - Monsoon Magic. They have come up with beautiful paragraphs once again and we wanted to share few of them with you. The onset of monsoon creates magic in the atmosphere. The beautiful smell of the first raindrops falling on the parched earth and the sight of deep, dark clouds racing overhead enthral many a heart. Almost overnight the landscape is transformed. Green shoots appear everywhere and frogs start croaking in the puddles of water. A lucky few rewarded with the sight of dancing peacocks. Friends huddled together near the window, watching the rain pouring down while enjoying mother's yummy pakodas - images that stay long in our memories. Monsoon is truly magical. In our country, the rainfall season usually begins in the month of June. One day I was playing with my friends in the park. Suddenly, it started to rain so we took shelter under a tree but it was of no use. Few of my other friends came out to play football in the rain, so I joined them. After football we started to run around and play. We saw a puddle, we went and jumped in the puddle, the brown water splashed on us! By then, our parents came down to call us home and seeing us drenched they were shocked! I came home and had a hot shower and had something hot to drink. It's fun playing in the rain but it could get messy and we could get sick, so we should take care. In the monsoon season it rains a lot and sometimes thunder also comes. The thunder is very loud and it irritates me. Along with he thunder, lightning also comes and it's too flashy to look at. Due to the rain and wind, the TV signal will not be good and the picture will look blurred. Sometimes I like monsoon because we can see the rainbow and it looks colourful. I used to play in the rain and muddy puddles. I like monsoons season better when it does not rain because monsoon season is pleasant. I don't like it when it rains because none of my friends will come out to play. Oh! Rain, how magical you are. Monsoon brings happiness and joy all around us. We splash water and make colourful paper boats. During the monsoon season I would sit in my balcony and look at my plants: tulsi, hibiscus and many more. I would also observe the beautiful trees, flowers and the rain falling on the rocks from my balcony and even stars with the moon! I would love to wear my black leather jacket and sit and eat sandwiches, soup, milk and tea. I would be even more eager to see the peacocks dancing. I would never miss getting drenched in the rain. I love rain and i want that it rains all the time. Monsoon is my favourite season because it rains. I can play in the rain all day. We get green crops because of the rain. It also cleans up all the dirty places. During summer everything dries up but once it rains we get awesome weather. There are birds flying everywhere. When i was a kid I used to play with paper boats in puddles of water. Farmers love the rain as it leads them to success. Today we simply wanted to share a beautiful song we showed at our morning assembly to our students. It was the Creator's house assembly and the topic was "Working together pays off". Then they shared with us the inspirational story of the choir from Uganda - orphans who made a difference with a help of some passionate and dedicated people! The spirit of the story is beautifully captured in the song "Together we can change the world". It was a lovely way to start our busy day! Don't you agree? An Article On 'Father's Day' from the Language Department !!!! పితృదినోత్సవం , మాతృదినోత్సవం జరుపుకోవటం మన సంస్కృతి కాకపోయినా మన జీవితాలలో నాన్న పాత్ర ఎంతో ముఖ్యమైనది . అందుకనే ఈ రోజున నా మనసులోని భావాలను మీతో పంచుకోవాలనుకుంటున్నాను . చరిత్రను చూస్తే కొంతమంది జీవితగమ్యాలను నిర్దేశించటం లో తండ్రుల పాత్ర ప్రముఖంగా కన్పిస్తుంది . ఉదాహరణకు మన ప్రధాని శ్రీమతి ఇందిరాగాంధి . తండ్రి జవాహర్లాల్ నెహ్రూ గారు రాసిన లేఖలు ఆమెకు ఎన్నో విషయాలలో మార్గదర్శకమయ్యాయి . అంతెందుకు మన ఓపెన్ మైండ్స్ పాఠశాల స్థాపనకు కూడా మూలం తమ తండ్రి శ్రీ సుధాకర రెడ్డి గారి ఆశయమేనని, మన డైరెక్టర్ శ్రీమతి షర్మిల గారు చెప్పారు. ఈ సందర్భంలో నేను మా నాన్న గారి మాటలు గుర్తు చేసుకుంటూ వుంటాను. ‘ మనం పని చేసే చోట ఎంతో నిజాయితీ గా వుండాలి. క్రమశిక్షణగా వుండాలి. మన అసంతృప్తి ,వ్యక్తిగత సమస్యలు పనిలో చూపించకూడదు .’అని చెప్తువుండేవారు.ఆ మాటలని ఆచరించటానికి నేను ప్రయత్నిస్తూ వుంటాను. ఒక ఉపాధ్యాయినిగా నేను ఎంతో మంది తండ్రులను చూశాను. వారి కళ్ళల్లో వారి పిల్లల పట్ల కనిపించే అనురాగం, తమ పిల్లలు ప్రపంచం లో అందరి కన్నా గొప్పవారిగా అవ్వాలి అనే ఆశ చూశాను. మారుతున్న ఈ కాలంలో తల్లులతో పాటు తండ్రులు కూడా పిల్లల బాగోగులు పట్టించుకోవలసివస్తోంది. వారికై ఎక్కువ సమయం కేటాయించవలసి వస్తోంది. మన ముద్దుమురిపాలను తీర్చి, మన భవిష్యత్తును తీర్చిదిద్దటానికి పాటుపడే నాన్నకు జేజేలు చెపుదాం. ముసలితనంలో అమ్మానాన్నలకు అండగా నిలుద్దాం. వారికి ఆనందాన్ని కలిగిద్దాం. వేసుకుంటాను నా జీవితానికి పూలబాట తెలుగు ఉపాధ్యాయిని. MOTHER wrote about her SON'S emotions !!! He waves me happily off each morning, and the beautiful hug he gives me every afternoon on the reunion at the school gate. Seeing my independent, confident, happy little boy embrace this new stage of his life fills me pride. He talks animatedly about the new friends he is making, his “best friend at school” – and the fun and challenging things he is doing in the classroom. But then there are the difficult moments. Starting primary school - such a big life change, has also come with its fair share of big emotions for my sensitive boy. After trying so hard to concentrate and control his impulses all day, those emotions often came home looking for an outlet. Any small thing has the potential to set him off - from running out of his favourite snack to losing a pencil lid - and from this small inconvenience a large meltdown often take issues. For a while I was at a loss about how to handle this. I wanted to try and understand where he was coming from but also be firm about expected appropriate behaviour – slamming the door and telling me he hates me were deal breakers. I also wondered what I could do to prevent the meltdowns before they happened, but in some ways it seemed they were unavoidable events – he was looking for a reason to just blow off steam. I tried talking to him, explaining, ignoring, comforting – nothing seemed to be working. After one particular session of him shouting at me while I was trying to cook dinner, I shouted back at him in frustration, which had sent him running to his room and left me feeling awful. On another day, after sending him to his room to calm down for the third time in as many days, he implored me not to leave him there. “This is not teaching me anything!” he shouted, “I don’t want you to leave me here alone!” I sighed and asked “Okay, what is going to help you right now? What do you need? Do you need a cuddle?” He cried and said yes, so I sat on the bed and cuddled my big boy (who is really not so very big) while he sobbed his little heart out for several minutes. All the tensions of the day came flooding out with his tears. 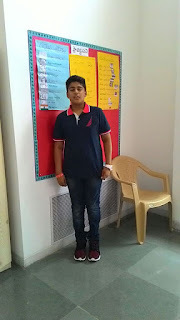 When he had calmed down a bit, I focused on empathy - I spoke to him gently and said that I know he is working very hard each day to sit still in class and concentrate on what the teacher is saying, and I know that takes a lot of effort. I told him it’s okay to be angry, and it’s okay to cry, but it’s not okay to slam doors and to say you hate me. His response: “I don’t really hate you mum I’m just saying that so you will know that I am angry.” I told him I know he doesn’t hate me and I also know that he is angry - he doesn’t need to shout and scream for me to understand that. That’s when he said something that really clicked for me. “But when I’m talking to you, you are doing other things and not listening properly and so I have to scream and shout.”This is when I realised that, often when he comes home from school, I will be listening to him while I am attending other activities. 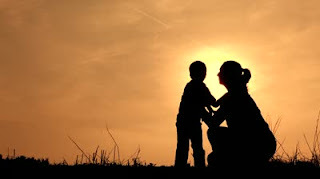 But from my son's point of view, if I am not giving him my full attention I am not listening at all, and so a small frustration takes on huge proportions. What I think he was telling me is that after a full day at school he needs my undivided attention for a certain length of time to regain his equilibrium. I am sure the other factors – tiredness, learning how to control his impulses – still apply, but since that discussion I have made a concerted effort to just sit with him for 15 minutes when we get home, and listen, cuddle or play. Everything else has to wait. It was by listening to my five-year-old that I was reminded of the simple truth that small changes can make a big impact. The first Happiness Week of this academic session ends today and we did have a good learning of the topic ‘Discipline’. All the students were spoken to in detail about why ‘Discipline’ is so important in life and in our day-day activities. 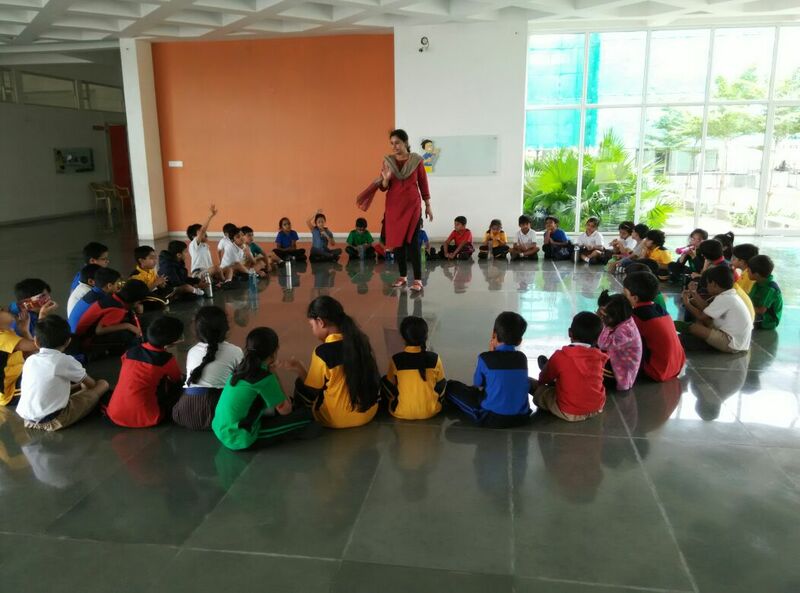 It was wonderful to see the students of Grade 1, who did not know the word ‘Discipline’, now understand how important it is to behave well. 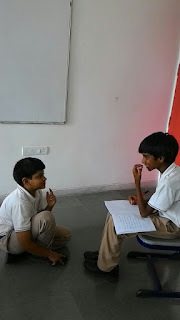 The middle school students even came up with instances where they felt they were not so well behaved last year, and have now committed to work on the same and exhibit more coordination with others. There has been a significant change in how they were ready to take up more responsibility. The ‘Buddy System’ is now in place and the list has been shared with the students as to which team they would belong to. A teacher will head each team so that there is a constant monitoring of how this system is working. The final list will be shared with all the students on Monday. The best execution of the idea came up when the entire Student Committee was being formed this week. The senior students nominated themselves for the committee and campaigned for votes. 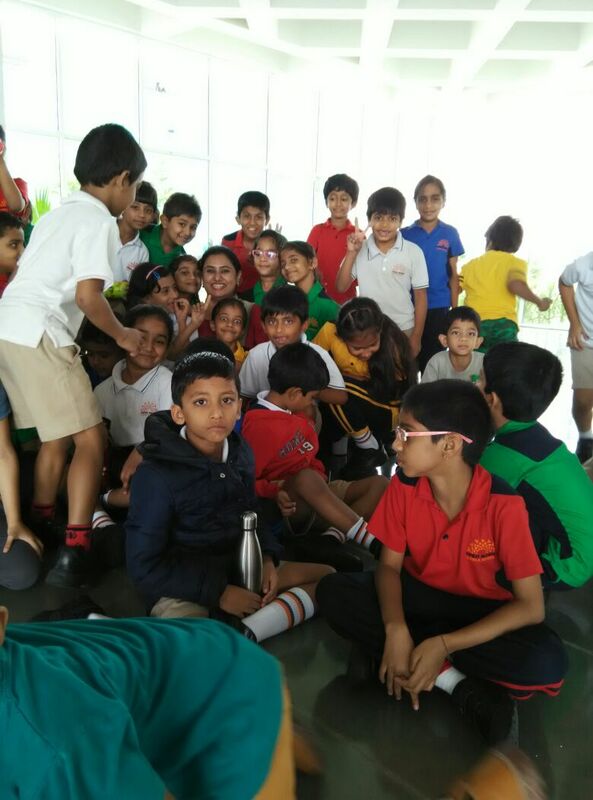 It was a tough competition and was wonderful to see how each of them had an agenda and ‘good behavior’ topped the lists! It was the ‘Election Day’ for the student committee and all the students from Grade 1-9 had an experience of a real-time voting system. 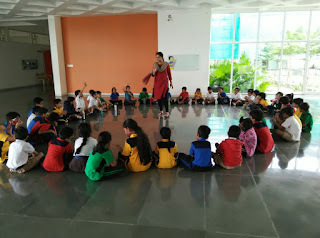 All these activities being lined up in the same week gave the students more inclination towards understanding ‘Discipline’ and its importance to the core. Will come up with another interesting theme and learning for the next month. Once again, we thank all our parents for the continued faith and support in us! As we start our new session and are settling in, we look forward to meeting with you for our first session of the ‘Precious Parent’ workshop series. It would be an interactive workshop where we are all together trying to find the best of ourselves for our children. 10am - 12:30pm on 20th June, Saturday. 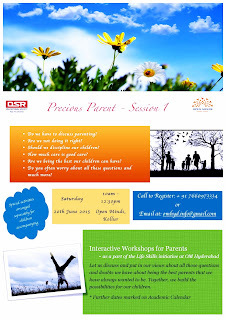 The workshop is being conducted by me. Do message us on +91 7660973334 for confirming your presence latest by 12pm on Friday 19th June. Join us and help us build a healthy community for our children! 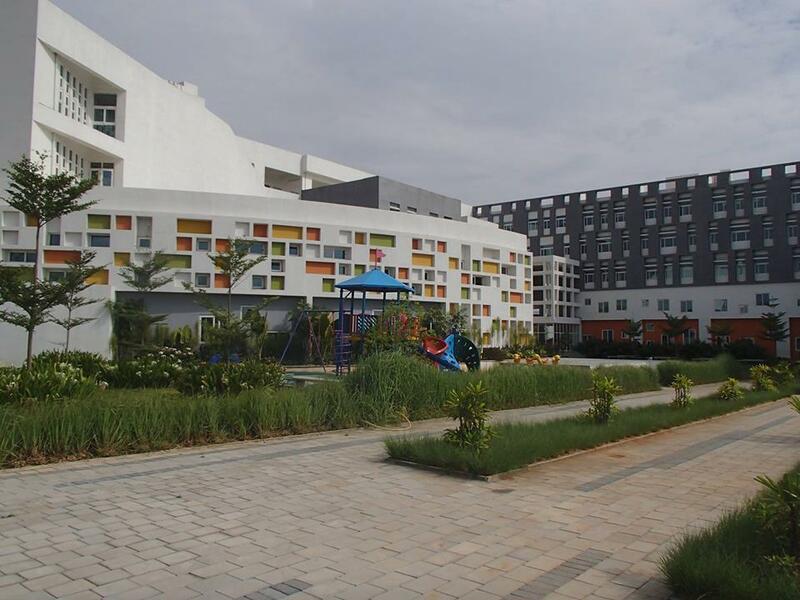 Open Minds, A Birla School. It was a little difficult for me to compose a blog-post mainly about happiness because I don’t believe in chasing it. But happiness is just one of many rich feelings that give me, and I think most people, a feeling of humanity and a sense of living a full and meaningful life. When happiness is absent in our daily lives or is fleeting, that’s a sign that something is more seriously wrong – and it’s the time to get support from experts, not the time to chase happiness. 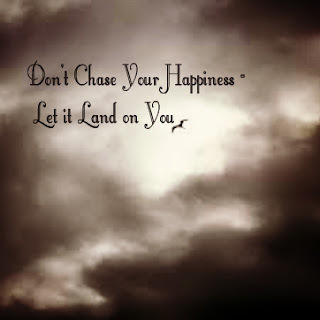 Because if you run after happiness you may never catch it. You are tired, you’re grumpy, you don’t feel like reading a book to your child before he goes to bed. Telling yourself “Reading is important, you should love this time with your child, reading is fabulous, smile and carry on” will probably just exhaust you, and you’ll be no happier. Accepting and noticing that you are more tired than usual and offering to play a simple game instead, or look at picture books together, or watch a favourite television show, will probably leave you feeling more relaxed – you can read a book tomorrow. 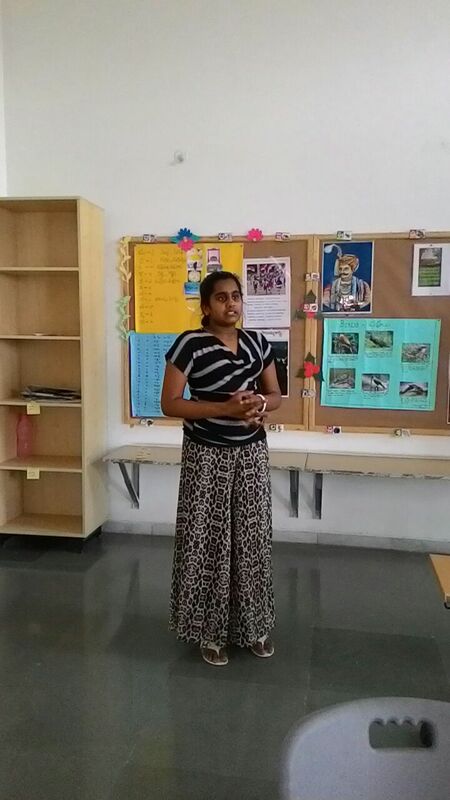 You might or might not be aware, but we have a wonderful Telugu teacher in our school - Vijaya Lakshmi ma'am! 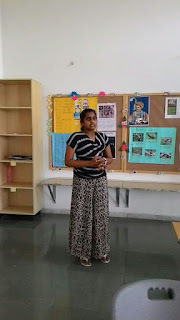 She is probably the kindest Telugu teacher ever. She is very passionate about her subject and enjoys teaching our students. 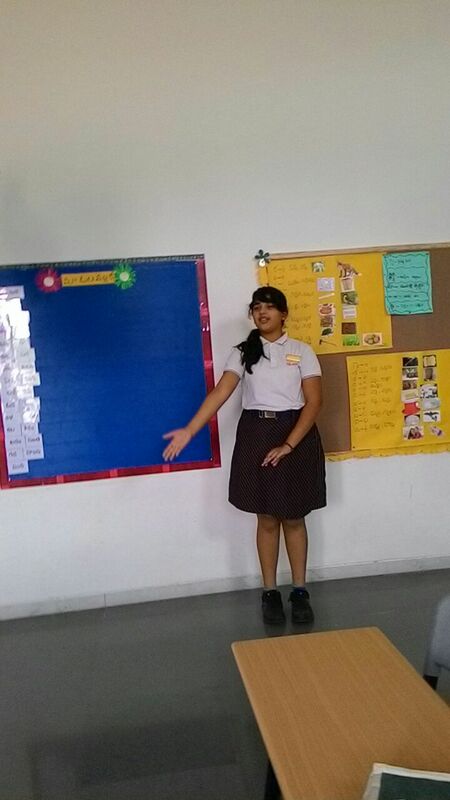 She has recently met with an accident where she fractured her hand but she continues teaching with all her might and is known to always encourage students to express them selves. Grade 6 students, Shishir and Anek, were recently doing a role play of a great Telugu writer, Sri Madhurantakam Rajaram, Jarina Gunde. 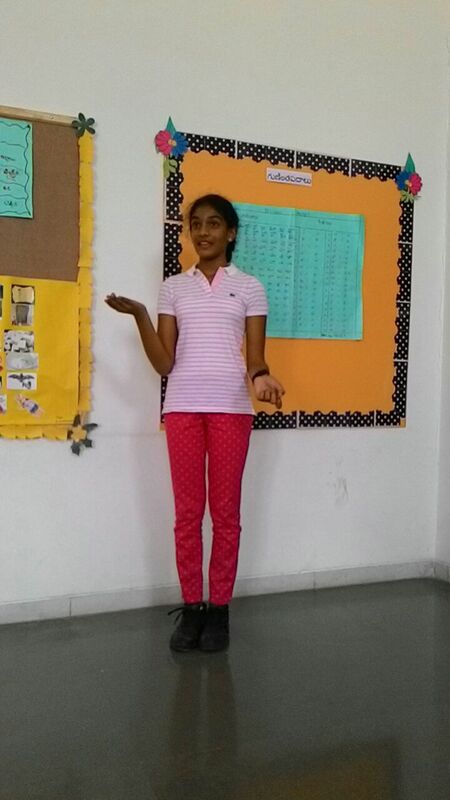 Grade 8 students: Krithi, Adhya, Guneet, Sanjana and Rithvik have practiced elocution in the Telugu class. Yes, in Telugu language, of course! Vijaya Lakshmi ma'am wouldn't have it any other way! Bullying is an unwanted, aggressive behavior among school aged children that involves a real or perceived superiority of power. Bullying can take many forms, such as hitting, kicking, threatening others, teasing, name-calling, excluding from a group, or sending mean notes or e-mails. A child who is being bullied has a hard time defending him or herself. Often, children are bullied not just once or twice but over and over. 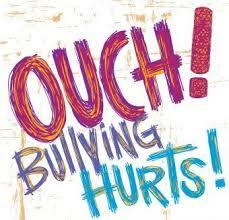 Bullying is very common during the elementary and middle school years especially between grades 4 and 8. Perhaps the attitude that bullying is part of growing up is what that makes the practice still common in all Indian schools. There is a lot of research that shows that being a victim of a bully can affect students’self-esteem and how they approach school. 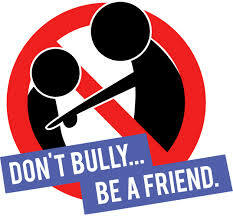 It is the victims of bullying who often report that they do not want to go to school because of fear of being bullied. Some children who are bullied decide, in turn, to bully others. For all of these reasons, it is important that schools address the bullying problem in their school. Most bullying happens at school and on the school bus to and from school. Bullying also can take place when kids walk to andfrom school.Bullying is more likely to happen when large groups of students are supervised by a small number of adults, including during lunchtime, recess, physical education, and during transition times. Students also report being bullied in the classroom when their teacher’s attention is diverted. Both boys and girls bully but there is some interesting differences in the way they bully. Boys tend to be bullied by other boys, whereas girls are bullied both by boys and girls. The most common form of bullying for both boys and girls is verbal bullying (teasing, name-calling). Boys are more likely to say that they are physically bullied. Girls are more likely to report being targets of rumour-spreading and sexual comments. Both boys and girls engage in what is called relational aggression. Individuals who use relational aggression tend to exclude students from a group,or they might threaten to not be someone’s friend unless he/she does what they say. Girls are somewhat more likely than boys, to bully each other through social isolation. Bullying often involves groups of students picking on another student. Within these groups, there often is a “ring leader”and a number of followers. In addition, many students observe bullying but do not necessarily take any action—they neither engage in the bullying nor help stop the bullying. Children and youth are often reluctant to try to stop bullying because they are afraid of being bullied themselves, because the want to be part of a popular group, or because they simply are not sure how to help. There are many factors within a child’s environment that can contribute to bullying behavior. Students who bully are more likely to witness violence in their home, have little parental supervision and lack warmth and involvement by their parents. Children who bully also are likely to “hang out” with others who bully and feel that they gain their popularity or “coolness” by teasing other students. Bullying thrives in schools where faculty and staff do not address bullying, where there is no policy against bullying and where there is little supervision of students—especially during lunch, bio-breaks. Negative models of bullying behavior are also prevalent throughout society—especially in television, movies and video games. What can be done to reduce bullying in school? The good news is that much can be done to stop bullying in our schools. A single school assembly, PTA meeting, or social studies lesson on bullying won’t solve the problem, however. 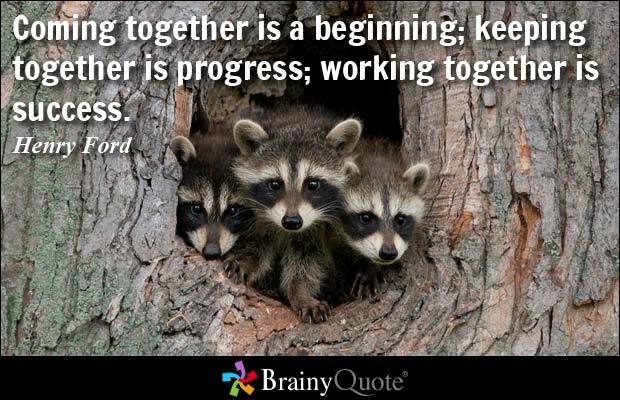 What is needed is a team effort by students, teachers, administrators, parents and other staff to change the culture, or climate of schools. Many schools are meeting this challenge.